Robert T. "Bob" Sims, Storekeeper 1/c, born Oct. 28, 1916, Meridian, LA, graduated Louisiana College, Pineville, LA, and joined the USNR Feb. 21, 1942. 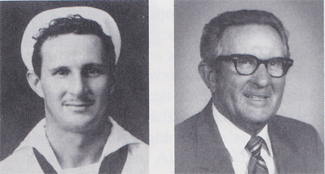 He was stationed at NTS San Diego, CA, and aboard the USS West Virginia. He boarded the Wee Vee in April 1942 when she was sitting on the bottom in Pearl Harbor. He helped raise her then stayed aboard until he left the ship in Tokyo Bay after the war. His entire time of service was spent aboard the USS West Virginia. The experience he will never forget was at 4:00 AM, the Battle of Surigao Strait. His battle station was the 20mm gun tub on the #2 deck, starboard side. Those 16" barrels seemed to come around pretty close to them. His clothes were shredded when it was over, but he had a ring side seat. This he will always remember. He participated in the Liberation of the Philippines, Lingayen Gulf, Battle of Surigao Strait, Mindoro, Iwo Jima and Okinawa. Discharged Nov. 1, 1945. He and his wife Mildred live in Amarillo, TX. They have one child. Employed with retail lumber business and building contractor. He enjoys golfing and fishing.